I figured I'd join the forum after purchasing my baby, a 2002 Pontiac Sunfire GT. This is the nicest car I've owned to date, which might tell you something about the cars I drove before... Lol. 2.2 EcoTec, auto, sunroof, monsoon stereo with amp... I love it. Just over 100k on the engine, just over 200k on everything else. Timing chain was just replaced. Happy to be a part of the community, I look forward to seeing what everyone else is driving! -- Improvise, adapt and overcome. Michigan eh? Downstate or UP? Metro Detroit ATM but I've lived all over the state. Only been to the UP once though unfortunately. Welcome to The Org. Jacob! You've got my Sunfire's twin! Do you have any modifications planned for it? Oh, sweet! I don't plan on doing anything extreme, there are a few things I'd like to get fixed/replaced yet. I need new rear struts, and could probably use tires, although I still have plenty of tread, but they're cheap tires. Other than that... I'd like to do an intake, possibly an exhaust. It's my daily so I only really want it to be loud when I step on it. I'd also like to do a few cosmetic things, I'd really like to paint my wheels black, and I HATE that spoiler. I'd like to try and find one that looks like the spoiler off the Sunfire GXP concept. The paint could use some work too, I used Meguairs gold class car shampoo and conditioner, as well as their wax, and clayed the whole car but there was previous scratching and chipping of the pains, as well as some discoloration just below the fuel door from gas dripping down the paint. So yeah, nothing crazy. Lol. Currently in Lapeer. Metro Detroit area. 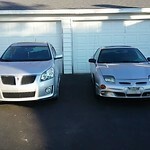 One neightbor have one Sunfire GT, driven it a couple of times and I really enjoyed it.